An Onondaga from the Six Nations of the Grand River, Tom Longboat (1887-1949) was one of the world's great long-distance runners. He ran his first official race in Caledonia in 1905 and two years later shot to international attention with a record-breaking win in the Boston Marathon. He represented Canada in the 1908 Olympics. Hailed as professional world champion the following year, Longboat went on to set world records for 24- and 32-km races. During the First World War, he served as a dispatch runner with the Canadian Expeditionary Forces (1916-19). 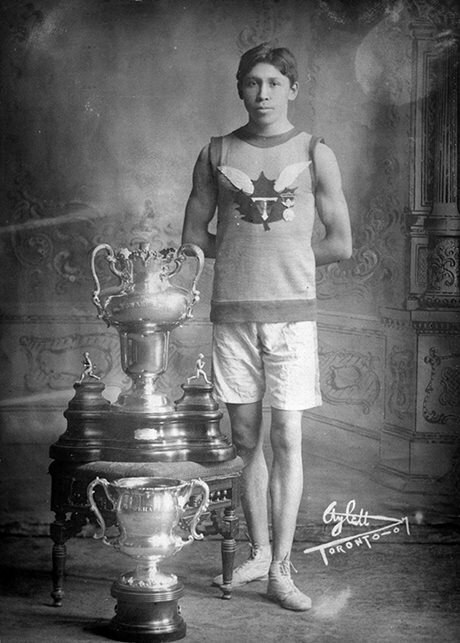 Tom Longboat is a member of the Canadian Sports Hall of Fame. Visit the Ontario Heritage Trust’s provincial plaque at 1799 4th Line, near the Six Nations Council House, in Council House Park, Ohsweken, Ontario. Listen to a CBC Digital Archives broadcast from October 8, 1977 of Wilton Littlechild talking about Tom Longboat, including his marathon triumphs and Olympic disappointment. See Longboat’s cradle-board, made by William Sugar, on the Canadian Museum of History website. Watch Historica Canada’s Heritage Minutes video on Longboat.